If you are following this blog, then let me encourage you to go to my Wordpress website and start following my entries through the blog function on that site. This blog will remain up because it has some useful information, but future posting will be done through my Wordpress site. Welcome to Tarotscope, a combination of Astrology and Tarot. Each month I will draw a card for each sign of the Zodiac. That card represents the meditation for the month for that Sun Sign. The Sun Sign represents your Primary Drive in life, how you best manifest your Life Path, and how the light of the Sun energizes you each day. The Deck I am using this month is the Mythic Tarot. Aries (March 21st to April 21st): Maverick Active Fire energy fuels your Primary Drive. Your Life Path energy operates best independently; you must learn self-discipline to manifest your best results. Your card this Sun cycle is the King of Pentacles, and your message is "set your goals and work to achieve them." This card encourages you to plan for the future. The lesson is: "long-term success comes through long-term investment, persistence, and vision." For Aries this card can be quite challenging; ask yourself, "what do you see in the long view?" Taurus (April 21st to May 21st): Persistent Stable Earth energy fuels your Primary Drive. Your Life Path energy operates best when you feel secure; you must learn some degree of adaptability to manifest your best results. Your card this Sun cycle is the King of Cups, and your message is "take charge with and of your emotions" This card encourages you to act maturely and lead in difficult emotional situations that arise during this cycle. The lesson is: "use your emotional strength this cycle to help others in need." Cancer (June 21st to July 21st): Nurturing Active Water fuels your Primary Drive. Your Life Path energy operates best when you care-take yourself and others properly; you must learn "emotional balance" to manifest your best results. Your card this Sun cycle is the 6 of Cups and your message is "reflect on your relationship choices and what you want going forward." This card encourages you to think about the past in order to make good decisions in the future. The lesson is "never stop growing in your relationship." If you are not growing or have not be growing through your relationship, then it is time to let it go and pursue someone new. Leo (July 21st to August 21st): Strong-burning Stable Fire fuels your Primary Drive. Your Life Path energy operates best when you are creative; you must learn structure to manifest your best results. Your card this Sun cycle is the Page of Wands and your message is "seek and adventure" This card encourages you to take a risk that excites your passion and leads to an adventure. The lesson is: "go out into the world and try something new or go someplace new and see what opportunities appear before you." Magic often happen when you leap enthusiastically into the unknown. Virgo (August 21st to September 21st): Practical Adaptable Earth fuels your Primary Drive. Your Life Path energy operates best when you get all the details in order; you must learn to "see the forest for the trees" to manifest your best results. Your card this month is the 7 of Wands and your message is "be prepared to fight for what you want." This card reminds you that sometimes conflict is the only way to resolve certain situations. The lesson is: "force is sometimes necessary to defend what you have and protect those you love." If conflict arises for you this cycle, are you ready to meet force with force if required? Libra (September 21st to October 21st): Analytical Active Air fuels your Primary Drive. Your Life Path energy operates best when acting logically; you must learn to mix in feelings to manifest your best results. Your card this Sun cycle is the 9 of Swords and the message is "some fate you cannot escape." This card reminds us that sometimes we have to face the music and persevere when persecuted. The lesson is: "in life we sometimes face unfair judgment and must find a way to survive or overcome." Scorpio (October 21st to November 21st): Intense and Deep Stable Water fuels your Primary Drive. Your Life Path energy operates best when bringing or experiencing transformation; you must learn "playfulness or lightness of heart" to manifest your best results. Your card this Sun cycle is The High Priestess and the message is "you will have to use your knowledge of the light and dark on some emotional issue to help another or others in need." This card encourages you to take a painful lesson and use the knowledge and experience in the aid of another who would gain from your wisdom. The lesson is: "nobody gets their character tested when things are going their way." Sagittarius (November 21st to December 21st): Expansive Adaptable Fire fuels your Primary Drive. Your Life Path energy operates best exploring openly and trying new experiences; you must learn to map and record your knowledge to manifest your best results. Your card this Sun cycle is the Knight of Pentacles and the message is "spend some resource and take some action in a quest for a new opportunity." This card encourages you to remember that sometimes you have to spend money to make money. The lesson here is "money is energy and it is meant to flow to grow." Capricorn (December 21st to January 21st): Ambitious Active Earth fuels your Primary Drive. Your Life Path energy operates best when you are setting and achieving goals; you must learn compassion to manifest your best results. Your card this Sun cycle is The Emperor and the message is “embrace your power and wield your authority." This card encourages you to acknowledge and utilize power you have in an area of your life that comes into focus this cycle. The lesson is: "with great power comes great responsibility." Aquarius (January 21st to February 21st): Unconventional Stable Air fuels your Primary Drive. Your Life Path energy operates best when you are authentic and unrepentant; you must learn quiet fortitude to manifest your best results. Your card this Sun cycle is the 2 of Cups and the message is "good fortune can come when you least expect it." This card encourages you to keep faith and remain calm when dealing with an unknown in an important relationship. The lesson is: "sometimes we feel trapped and must wait for providence to reveal itself." And the best way to invite a positive outcome is to accept our fate until the truth is revealed. Pisces (February 21st to March 21st): Imaginative Adaptable Water fuels your Primary Drive. Your Life Path energy operates best connecting with others emotionally; you must learn toughness to manifest your best results. Your card this Sun cycle is the 2 of Swords and the message is "you must deal with a situation you cannot control." This card encourages you to think about how you will face a potential no-win scenario if you find yourself trapped with no good choices. The lesson is "think outside the box or remain frozen by a situation." It's pretty much impossible to be a professional astrologer and not throw my hat in the ring that is this upcoming major transit configuration, a Grand Cardinal Cross, involving Uranus in Aries, Jupiter in Cancer, Mars in Libra, and Pluto in Capricorn. They will all be at 13 degrees on 4/23, forming a perfect partile (less than one degree orb) grand cross. Others have written or spoken extensively on this upcoming event and I'm not going to try to add to the discussion in the usual way (links to various thought about this configuration are at the end of my entry). What I thought might be interesting is to consider this grand cross using the Sabian and Fairchild symbols. At this time, Uranus in Aries is square Pluto in Capricorn, which is opposed by Jupiter in Cancer, which squares back to Uranus in Aries, forming a powerful T-Square that will become the grand cross when retrograde Mars backs up to 13 degrees of Libra. Mars is the "trigger man" of this configuration, which means some kind of aggressive or explosive action will likely set off the work of these energies. While I am not ruling out a global event, I suspect there will be multiple events that may have lasting impact without necessarily turning things upside down on the day of or the days around the event. The Uranus/Pluto square this month will be the 5th of 7 exact squares, with one more occurring on 12/15/2014 and the last one on 3/17/2015. Like all previous Uranus/Pluto events, the square back in 1932 to 1934 and the conjunction in 1965 to 1966, monumental changes took place, setting up the next major cycle in human history. We are living through the next phase of monumental change, being expressed through financial crisis, energy management, overpopulation, rapid technological advances, and medical breakthroughs. By 2018 the work of the last eight years will be fully activated and by 2024 (when Pluto exits Capricorn), the New World Order will be in place. With each energy point between the 13th and 14th degree on 4/23, here are the Sabian interpretations nuanced for each point in sign. Uranus in Aries (13/14) - A serpent coiling near a man and woman; the key word is "revelation." When positive, we act with self-discipline; when negative, we act selfishly. Uranus encourages us to act authentically and inventively. As old institutions falter, creative and maverick thinking will be required to create the new paradigms humanity will need in the near and distant future. Mars (retrograde) in Libra (13/14) - A moon siesta; the key word is "recuperation." When positive, we act deliberately; when negative, we are apathetic. Mars in Libra suggests a legal battle or battle of words, speaking more to the boiling currency war than the conflict like the one involving Russia's military. Jupiter in Cancer (13/14) - A very old man facing a vast dark space to the northeast; the key word is "sanction." When positive, the proper enlistment of hidden or deep emotional elements need for success; when negative, chaos. Jupiter in Cancer suggests expansion through caring, a vision of the earth as our home and in need of proper care taking. Pluto in Capricorn (13/14) - An ancient bas-relief carved in granite; the key word is "foundation." When positive, old foundations give way graciously to new ones; when negative, meaningless limitations. Pluto in Capricorn is the big player, suggesting an earthquake to all established institutions to create the necessary transformation to new, better goals for humanity. These four energies challenge one another (revelation challenges sanction challenges recuperation challenges foundation; and revelation opposes recuperation and sanction opposes foundation). Never more true is it than now to say, "the old ways need to be obliterated to create new space for new approaches. Never has the discussion of the monetary system(s) been so active in the last 60 years. With each energy point between the 13th and 14th degree on 4/23, here are the Fairchild interpretations nuanced for each point in sign. Uranus in Aries (13/14) - A walking stick; the key words are "balance, prestige, support, and power." We must learn to walk authentically and "on our own" to a certain extent. There will be a growing need for entrepreneurs of every ilk going forward as corporate capitalism falls more and more the weight of its own excess. Mars (retrograde) in Libra (13/14) - Crop circles; the key words are "embrace the Earth." We desperately need more laws protecting the environment, but instead we see more access to protected lands for resources and freewheeling where fracking is concerned. These choices to plunder are likely to be the true trigger events in the coming months and years ahead. Jupiter in Cancer (13/14) - A small green frog on a tree branch; the key words are "the ordinary life can be a place of immense happiness." Expansion of nurturing, caring energy; as well as a refocus on the family is needed to move our entire civilization forward. Pluto in Capricorn (13/14) - A hawk with a snake in its beak; the key words are "we must grow and change to be lifted up spiritually." Rapid changes, like the acceptance of gay marriage and now recreational marijuana herald a new era of openness that is firing up old institutions to attempt to keep the status quo in place. Welcome to Tarotscope, a combination of Astrology and Tarot. Each month I will draw a card for each sign of the Zodiac. That card represents the meditation for the month for that Sun Sign. The Sun Sign represents your Primary Drive in life, how you best manifest your Life Path, and how the light of the Sun energizes you each day. 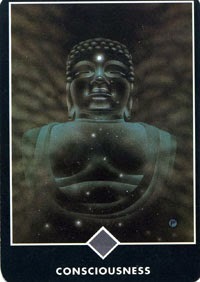 The Deck I am using this month is the Osho Zen Tarot. For Indian Hindu visitors: I practice Western Tropical astrology, so the Sun Signs are based on the months of the year rather than the Zodiac constellations, which have shifted over time. If you were born between March 21st and April 21st, you will be an Aries in Western Tropical astrology instead of the Pisces you are in Vedic Sidereal astrology. These systems are not mutually exclusive, each one teaches us something different about the spiritual condition and I find Indian clients pleasantly surprised by the new insight a Western reading of their chart provides. Aries (March 21st to April 21st): Maverick Active Fire energy fuels your Primary Drive. Your Life Path energy operates best independently; you must learn self-discipline to manifest your best results. Your card this Sun cycle is the 15th card of the Major Arcana, The Devil, and your message is "do it your own way." This card encourages you to rebel and break the rules so ou can grow spiritually through an act of revolution. The lesson is: "certain kinds of change can only occur when actions are done against the status quo." Taurus (April 21st to May 21st): Persistent Stable Earth energy fuels your Primary Drive. Your Life Path energy operates best when you feel secure; you must learn some degree of adaptability to manifest your best results. Your card this Sun cycle is the 7th card of the Major Arcana, The Chariot, and your message is "go after what you want with single-minded purpose." This card encourages you to follow your heart's desire with intensity. Go hard, go fast, or go home! The lesson is: "to manage your passions to the highest degree, you must have tremendous willpower." Cancer (June 21st to July 21st): Nurturing Active Water fuels your Primary Drive. Your Life Path energy operates best when you care-take yourself and others properly; you must learn "emotional balance" to manifest your best results. Your card this Sun cycle is the Ace of Swords and your message is "think in a new way about a current situation." This card encourages you to think outside the box or look with a new perspective. The lesson is "old patterns of thinking stagnate the mind and it becomes necessary explore new ideas." Leo (July 21st to August 21st): Strong-burning Stable Fire fuels your Primary Drive. Your Life Path energy operates best when you are creative; you must learn structure to manifest your best results. 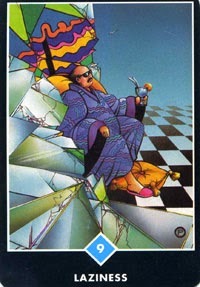 Your card this Sun cycle is the Prince of Cups and your message is "find pleasure and indulge yourself." 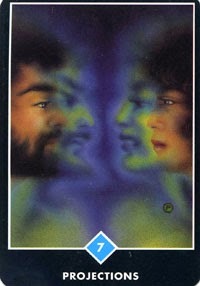 This card encourages you to seek emotional and physical enjoyment; engage in sensual play; pursue a romance. The lesson is: "desire fulfilled is one of the great gifts of our physical lives." Virgo (August 21st to September 21st): Practical Adaptable Earth fuels your Primary Drive. Your Life Path energy operates best when you get all the details in order; you must learn to "see the forest for the trees" to manifest your best results. Your card this month is the 8 of Disks, Prudence, and your message is "reach for the stars, but keep your feel on the ground." This card encourages you to balance vision/hope/desire with what can be achieved realistically. The lesson is: "have your dreams AND know your limits." Take only calculated risks during this cycle. Libra (September 21st to October 21st): Analytical Active Air fuels your Primary Drive. Your Life Path energy operates best when acting logically; you must learn to mix in feelings to manifest your best results. Your card this Sun cycle is the 8 of Wands, Swiftness, and the message is "seek out those who are you equals and share your worldview." This card encourages you to spend this cycle connecting with those of like mind. The lesson is: "shared vision with others brings the gift of acceptance and immediate understanding." Scorpio (October 21st to November 21st): Intense and Deep Stable Water fuels your Primary Drive. Your Life Path energy operates best when bringing or experiencing transformation; you must learn "playfulness or lightness of heart" to manifest your best results. Your card this Sun cycle is the 7 of Disks, Failure, and the message is "nobody gets their character tested when things are going their way." This card encourages you to determine how you will respond to a setback and whether you see your limits before a failure exposes them. The lesson is "know your limits or they will be exposed for you through a failure." Sagittarius (November 21st to December 21st): Expansive Adaptable Fire fuels your Primary Drive. Your Life Path energy operates best exploring openly and trying new experiences; you must learn to map and record your knowledge to manifest your best results. 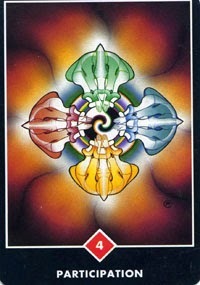 Your card this Sun cycle is the Prince of Disks and the message is "have a plan." This card encourages you to map out your moves and decisions; do not improvise or shoot from the hip this cycle. The lesson here is "careful planning assures positive outcomes, especially in complex or complicated situations." There is no substitute for great preparation. Capricorn (December 21st to January 21st): Ambitious Active Earth fuels your Primary Drive. Your Life Path energy operates best when you are setting and achieving goals; you must learn compassion to manifest your best results. Your card this Sun cycle is the 8 of Cups, Indolence, and the message is “rediscover or reignite your passion." This card encourages you to address any area of our life or relationship that has a long emotion history but no longer contains any emotional value. The lesson is: "a long emptiness is no substitute for short passion." Aquarius (January 21st to February 21st): Unconventional Stable Air fuels your Primary Drive. Your Life Path energy operates best when you are authentic and unrepentant; you must learn quiet fortitude to manifest your best results. Your card this Sun cycle is the Princess of Cups and the message is "trust your feelings." 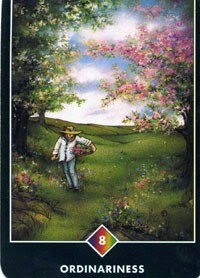 This card encourages you to cast yourself out into life with openness and a sense of adventure. The lesson is: "have faith and see where the currents of life take you when you do not try to steer." Pisces (February 21st to March 21st): Imaginative Adaptable Water fuels your Primary Drive. Your Life Path energy operates best connecting with others emotionally; you must learn toughness to manifest your best results. Your card this Sun cycle is the 9th Card of the Major Arcana, The Hermit, and the message is "time to find your own truth" This card encourages you to seek your personal truth by getting away from your connections in the world. The lesson is "you have all your answers inside and must walk the journey within to find them." Aries (March 21st to April 21st): Maverick Active Fire energy fuels your Primary Drive. Your Life Path energy operates best independently; you must learn self-discipline to manifest your best results. Your card this Sun cycle is the 20th card of the Major Arcana, Beyond Illusion, and your message is "pay attention to life's deepest truths." This card encourages you to assess all the situations and relationships in your life in terms of what you know to be true when you set your ego aside and see "beyond" your illusions. The lesson is "you can see necessary truths when you step back from your desires and expectations." Taurus (April 21st to May 21st): Persistent Stable Earth energy fuels your Primary Drive. Your Life Path energy operates best when you feel secure; you must learn some degree of adaptability to manifest your best results. Your card this Sun cycle is the 1st card of the Major Arcana, Existence, and your message is "focus on your life purpose." This card encourages you to work on self-care, self-assessment, and the choices you need to make in life. The lesson is "spend time working on yourself and planning your next goals in life." Cancer (June 21st to July 21st): Nurturing Active Water fuels your Primary Drive. Your Life Path energy operates best when you care-take yourself and others properly; you must learn "emotional balance" to manifest your best results. Your card this Sun cycle is the Fire to the South, Sharing, and your message is "give to receive." This card encourages you to put your energy outward, connecting with the people in your life and showing appreciation for their presence in your energy field. The lesson is "give appropriately to receive appropriately." Do not be stingy with others and do not over indulge them. Leo (July 21st to August 21st): Strong-burning Stable Fire fuels your Primary Drive. Your Life Path energy operates best when you are creative; you must learn structure to manifest your best results. Your card this Sun cycle is the 3 of Rainbows, Guidance, and your message is "seek another with more experience to guide you." This card encourages you to find someone who has traveled the path you are on, but is out in front of your journey. The lesson is "know when to ask for help." Virgo (August 21st to September 21st): Practical Adaptable Earth fuels your Primary Drive. Your Life Path energy operates best when you get all the details in order; you must learn to "see the forest for the trees" to manifest your best results. Your card this month is the 4 of Wands, Participation, and your message is "seek out others who help you along your journey." This card encourages you to connect with people of equal skill, even if they have different interests. Join these people to help you along your journey this cycle. The lesson is "two heads are better than one, three heads are better than two, and so on." Libra (September 21st to October 21st): Analytical Active Air fuels your Primary Drive. Your Life Path energy operates best when acting logically; you must learn to mix in feelings to manifest your best results. Your card this Sun cycle is the 6 of Air, The Burden, and the message is "stop taking sacrificing yourself for those who can take care of themselves." This card encourages you to engage in serious self-care and self-respect. The lesson is "everyone is responsible for his or her journey; you will suffer trying to lift up others who must do their own work." Scorpio (October 21st to November 21st): Intense and Deep Stable Water fuels your Primary Drive. Your Life Path energy operates best when bringing or experiencing transformation; you must learn "playfulness or lightness of heart" to manifest your best results. Your card this Sun cycle is the 2nd card of the Major Arcana, Inner Voice, and the message is "trust your intuition." This card encourages you to use your gut instincts more in your decision making this cycle. You have an emotional quotient that grows stronger with each emotional life lesson. It is as important as logic and reason. The lesson is for you to "trust that all your experiences, good and bad, contribute to knowledge you need to be successful in life." Sagittarius (November 21st to December 21st): Expansive Adaptable Fire fuels your Primary Drive. Your Life Path energy operates best exploring openly and trying new experiences; you must learn to map and record your knowledge to manifest your best results. Your card this Sun cycle is the 9 of Fire, Exhaustion, and the message is "rest before collapsing." This card encourages you to recognize that you are over extending in some or all areas of your life and you need to pull back into your own energy and space to take care of yourself. The lesson here is "choose self-care before you get worn down to such a degree that your energy forces some kind of break down to create the necessary space for re-balancing." Capricorn (December 21st to January 21st): Ambitious Active Earth fuels your Primary Drive. Your Life Path energy operates best when you are setting and achieving goals; you must learn compassion to manifest your best results. Your card this Sun cycle is the 1 of Rainbows, Maturity, and the message is “make a plan and manage your responsibilities." This card encourages you to address any and all situations with thoughtful engagement. The lesson is "I am responsible for my own happiness, not anyone else." Aquarius (January 21st to February 21st): Unconventional Stable Air fuels your Primary Drive. Your Life Path energy operates best when you are authentic and unrepentant; you must learn quiet fortitude to manifest your best results. Your card this Sun cycle is the 5 of Air, Comparison, and the message is "find understanding through comparison." This card encourages you to make comparisons as you consider your choices throughout this cycle. The lesson is "consider alternatives before moving forward." Pisces (February 21st to March 21st): Imaginative Adaptable Water fuels your Primary Drive. Your Life Path energy operates best connecting with others emotionally; you must learn toughness to manifest your best results. Your card this Sun cycle is the 10 of Air, Rebirth, and the message is "time to make a fundamental change in the way you perceive and present yourself to the world" This card encourages you to recognize that you need a profound change in your thinking and communication regarding an issue, situation, or person in your life. The lesson is "change is what you need more than stability this cycle." Welcome to Tarotscope, a combination of Astrology and Tarot. Each month I will draw a card for each sign of the Zodiac. That card represents the meditation for the month for that Sun Sign. The Sun Sign represents your Primary Drive in life, how you best manifest your Life Path, and how the light of the Sun energizes you each day. The Deck I am using this month is the Sun and Moon Tarot. Aries (March 21st to April 21st): Maverick Active Fire energy fuels your Primary Drive. Your Life Path energy operates best independently; you must learn self-discipline to manifest your best results. Your card this Sun cycle is the 13th card of the Major Arcana, Death-Rebirth, and your message is "embrace profound transformation this cycle." This card encourages you to bring to end something no longer appropriate in the course of your life so you can rebirth yourself in a new direction; this could a relationship, job, or a personal, unhealthy habit. The lesson is "everything changes" and it is best to move with the change than to resist. For you Aries, going in a new direction is easier than almost all the other signs (except, perhaps, Aquarius). Taurus (April 21st to May 21st): Persistent Stable Earth energy fuels your Primary Drive. Your Life Path energy operates best when you feel secure; you must learn some degree of adaptability to manifest your best results. Your card this Sun cycle is the Prince of Swords and your message is "be open-minded." The Prince is an adventurer; his energy goes out into the world and explores. Since this is the Prince of Swords, the exploration takes places using the mind. The lesson is "a closed mind does not travel far." This energy is a strong counterpoint for Taurus, which prefers to stick to tradition and remain steadfast in his/her beliefs. This month you need to engage in new conversations, read some new books, and explore new ideas. Gemini (May 21st to June 21st): Curious Adaptable Air energy fuels your Primary Drive. Your Life Path energy operates best doing tasks that stimulate your mind in a variety of ways; you must learn how to focus on demand to manifest your best results. Your card this Sun cycle is the 9 of Wands, Strength, and your message is "be prepared to defend what you have." Call on your creativity and your integrity to do what you know is right when situations this month challenge your virtue. The lesson is “do not take things that matter in your life for granted.” This lesson is very important for Gemini because you will need to take a stand or pick a direction rather than adapt. You must focus your energy this cycle. Cancer (June 21st to July 21st): Nurturing Active Water fuels your Primary Drive. Your Life Path energy operates best when you care-take yourself and others properly; you must learn "emotional balance" to manifest your best results. Your card this Sun cycle is the 3 of Swords, Sorrow, and your message is "take the time to process any lingering or unfinished sadness." Oddly enough this was the same message last cycle, but from a different card in a different deck. Cancer can hold onto emotional hurts longer than any other sign, so the Air energy of this card is about finding a way to move forward. The lesson is "process your emotions, do not wallow in them." The heart-shaped cloud pierced with 3 swords indicates the issue will involve your romantic or loving feelings for someone else. Leo (July 21st to August 21st): Strong-burning Stable Fire fuels your Primary Drive. Your Life Path energy operates best when you are creative; you must learn structure to manifest your best results. Your card this Sun cycle is the 7 of Swords, Futility, and your message is "accept the inevitable in order to move forward." The humorous, but accurate definition of insanity is "doing the same thing over and over again, expecting a different result." The lesson is "know when it's over ... really over." The figure sitting on the cloud is resigned and disappointed. So it must be in order to move forward. Look and see what is in your life during this cycle that must be released, no matter how painful, because you know it is futile to keep hoping for a different outcome. Virgo (August 21st to September 21st): Practical Adaptable Earth fuels your Primary Drive. Your Life Path energy operates best when you get all the details in order; you must learn to "see the forest for the trees" to manifest your best results. Your card this month is the 6 of Wands, Victory, and your message is "celebrate your success." Virgo can easily shun the limelight, but this cycle, you should accept recognition for a job well done and be sure to enjoy praise that comes your way thanks to your creative and persistent efforts. The lesson is "hard work deserves to be rewarded." Your successful efforts should not be overlooked and you should be willing to invite and accept praise. Libra (September 21st to October 21st): Analytical Active Air fuels your Primary Drive. Your Life Path energy operates best when acting logically; you must learn to mix in feelings to manifest your best results. Your card this Sun cycle is the 6 of Swords, Science, and the message is "use analysis to solve your problems." There is probably not a card better suited to your Sun sign energy, except the Major Arcana card Justice. You naturally solve problems and manage situation through analysis and testing, the very essence of this card. The lesson is "research and preparation are the keys to success." Scorpio (October 21st to November 21st): Intense and Deep Stable Water fuels your Primary Drive. Your Life Path energy operates best when bringing or experiencing transformation; you must learn "playfulness or lightness of heart" to manifest your best results. Your card this Sun cycle is the 21st card of the Major Arcana, the Universe, and the message is "reflect on all you have accomplished and failed to accomplish." This card encourages you to review the totality of your life to this point so you can make plans going forward towards the future you want. The lesson is "the sum is greater than the parts." Sagittarius (November 21st to December 21st): Expansive Adaptable Fire fuels your Primary Drive. Your Life Path energy operates best exploring openly and trying new experiences; you must learn to map and record your knowledge to manifest your best results. Your card this Sun cycle is the 4 of Cups, Luxury, and the message is "indulge yourself." This message is not a difficult one for you to embrace, as Sagittarius is the sign of the world-traveler and the explorer. You prefer experience as your primary learning tool This is a good month for a visit or two to the spa or a vacation. The lesson here is "take time to indulge; pleasure is one of life's great gifts." Capricorn (December 21st to January 21st): Ambitious Active Earth fuels your Primary Drive. Your Life Path energy operates best when you are setting and achieving goals; you must learn compassion to manifest your best results. 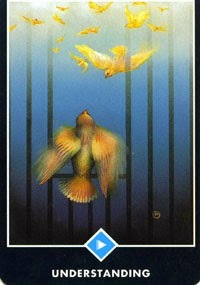 Your card this Sun cycle is the 5 of Cups, Disappointment, and the message is “what do we learn through loss." Oddly, this card follows rather perfectly on the heels of the Politics card from the last cycle. This cycle you must face an emotional letdown and figure out how you will move on and grow from the experience. The lesson is "loss teaches as much or more than gain." Aquarius (January 21st to February 21st): Unconventional Stable Air fuels your Primary Drive. Your Life Path energy operates best when you are authentic and unrepentant; you must learn quiet fortitude to manifest your best results. Your card this Sun cycle is the 4 of Wands, Completion, and the message is "be sure to finish what you start." Fire energy can easily burn out of control or fade out from a lack of fuel (passion and determination). This cycle you must make sure to go the distance and complete your creative tasks. The lesson is "success is measured by what you accomplish, not what you start." Pisces (February 21st to March 21st): Imaginative Adaptable Water fuels your Primary Drive. Your Life Path energy operates best connecting with others emotionally; you must learn toughness to manifest your best results. Your card this Sun cycle is the 7th Card of the Major Arcana, the Chariot, and the message is "assert your will to achieve." For Pisces this card can actually be quite challenging because it asks you to take charge, act powerful, and go after what you want and need aggressively, all traits Capricorn, Aries, Scorpio, Leo, and Sagittarius feel very comfortable doing, but not Pisces. The lesson is "willpower is necessary to move forward in a clear direction."